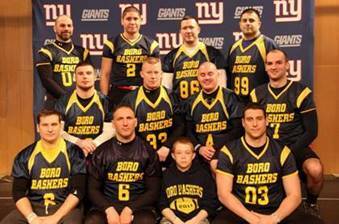 On March 22, Freehold Borough officers and supporters participated in the 2015 Snow Bowl to benefit the Special Olympics of New Jersey. Our officers raised more than $2,000.00 for the Special Olympics. This is the fourth year we have participated in this program. In all, the Snow Bowl raised more than $440,000 for the Special Olympics. The officers do this on their own time, and we would like to thank them for representing our police department and helping with such a worthy cause. From left to right on the top row: Russell Steenweg, Johnny Saada, Shaun Hobbs, Nicholas Iozzi; Middle row: Paul Hobbs, Kevin Werner, Patrick Healey, Brian Prisk; bottom row: Steve Weis, Scott DeLuca, Lance Hobbs, Rich McGraw.